Each year, the Boston Marathon is held on Patriot’s Day in Boston. Also called Marathon Monday, thousands of runners from throughout the world will come to the city to complete the 26.2 mile journal that begins in Hopkinton and ends in Boston. The Marathon is the world’s oldest and this year in 2013 there are expected to be around 27,000 runners. 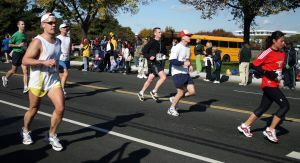 Our Boston injury attorneys wish all the runners good luck in completing the marathon and we hope that the spectators have a good time at the event. We also urge everyone to remember that there are safety issues for runners and pedestrians and that it is important for those in charge of the event to do everything possible to ensure it runs smoothly. The marathon runners who will be partaking in the famous race have trained long and hard for the event and hopefully will be able to cross to the finish line with no health issues. There will be first responders and emergency personnel present in case anyone involved in the race is hurt in order to provide assistance to the runners. Injuries due to lack of crowd control. Injuries if benches or scaffolding are not able to support sufficient weight. Injuries due to unsafe buildings along the path of the race. One incident reported by WHDH that occurred in 2011 involved a Babson College student falling five stories through a skylight while watching the Marathon on the roof. Injuries if debris is left on the ground in an area where people may be walking. Injuries due to negligent police or volunteers on vehicles in the race area. In 2011, for example, the Patriot Ledger reported that a woman was hit by a state police officer on a motorcycle while standing on the sidelines. These are just a few examples of situations where a person could be injured at the Boston Marathon. If you or a loved one is hurt as a result of someone’s dangerous property or someone’s carelessness while watching the Boston marathon, you may be able to file a claim for damages. Pay attention to the surface of the ground below you and try to avoid surfaces like areas with loose gravel that could be dangerous. Take note of the exits closest to you in case the crowd gets out of control. Be careful in choosing where to watch the race from. Remain calm if you are in a crowd that becomes out of control. By following these tips, hopefully you can stay safe and enjoy your time at the marathon this year. If you or a loved one has suffered an injury in Massachusetts, call the Law Offices of Jeffrey S. Glassman for a free and confidential appointment — 1-888-367-2900. Bus Driver Faces Criminal Charges after Boston Bridge Accident, Boston Personal Injury Attorney Blog, April 12, 2013.